MTR Vada Breakfast Mixes is an instant breakfast batter mix from MTR Foods. While reviewing this product we note that it is a mix of lentil and grain flours with ingredients like Black gram dal, rice, bengal gram dal, and maida. Although this product does not contain a lot of vegetable oil, it does not mention exactly which edible vegetable oil is used. Some vegetable oils contain very large amounts of biologically active fats called Omega-6 polyunsaturated fatty acids, which could be harmful in excess. This product is safe by itself but, as it is not a ready to eat product and requires cooking, for a safety rating we must consider the additions that people make to cook it. Vada is deep fried in oil and most people use vegetable oils for frying. Vegetable oils are very rich in polyunsaturated fatty acids, subject to easy oxidation at high temperatures. Oxidised PUFA is toxic and can cause a range of lifestyle diseases including cancer. 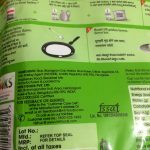 However, if this product is fried in fats that are low in PUFA, for example coconut oil, desi ghee or palmolein oil, the safety rating would be 2 points higher. In addition, this food product does not specify which edible vegetable oil has been used in it. We believe that it is not responsible behaviour for a brand to avoid clearly stating what ingredients have been used. 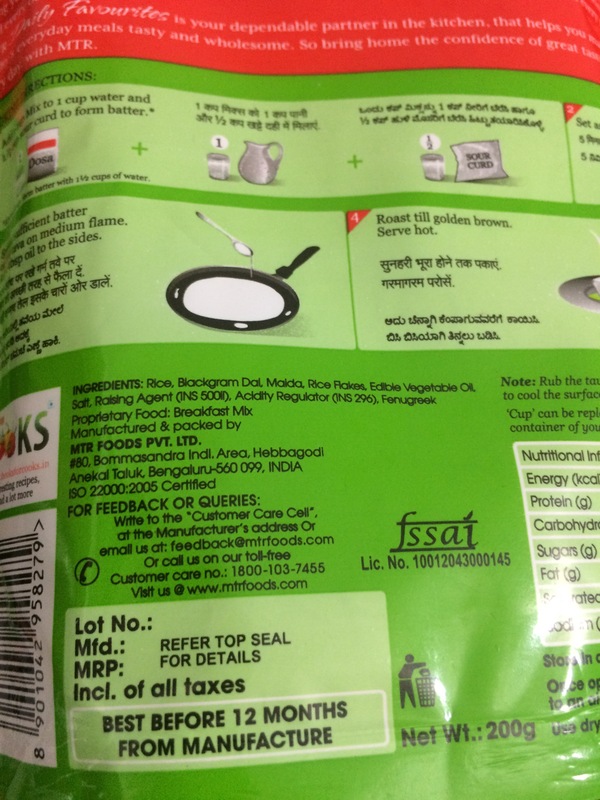 MTR Vada mix is nutritious with ingredients like Black gram, rice, Bengal gram dal and maida, but the product does not mention exactly which edible vegetable oil was used in the process which is depriving the consumer of the right to know what he is eating. Certain vegetable oils contain very large amounts of biologically active fats called Omega-6 polyunsaturated fatty acids, which could be harmful in excess. Excess polyunsaturated fats may react with oxygen, and oxidised Omega-6 fats can damage body functions and perhaps even vital structures like DNA. Also, consumers need clear information about the type of vegetable oil used, so that they can take action to maintain a healthy balance between Omega-3 and Omega-6 fatty acid consumption. It is also known as Sodium bi-Carbonate or Soda bicarb or baking soda. It is produced from seawater or salt and has natural minerals. It function as an acidity regulator, alkali, and rising agent. People who have alkalosis (too little acid in the body) or low blood levels of calcium or chloride must not consume IN 500. Malic acid is a natural acid present in most fruits and many vegetables. Commercially made by chemical synthesis. It is part of the metabolic pathway of every living cell. Used as acid, flavour compound and colour stabilizer in apple and grape juice. There are no side effects known. High concentrations are not permitted in infant food, as small children lack the capacity to metabolise large amounts of malic acid.